Enough to say that I am obsessed with Cath Kidston. This is only part of my collection (3 more mugs, last years diary, and the possibility that I have forgotten other items hidden somewhere in the room!). I was living in Leeds at the time, and was travelling home to South Shields on a regular basis. I wanted statement luggage. 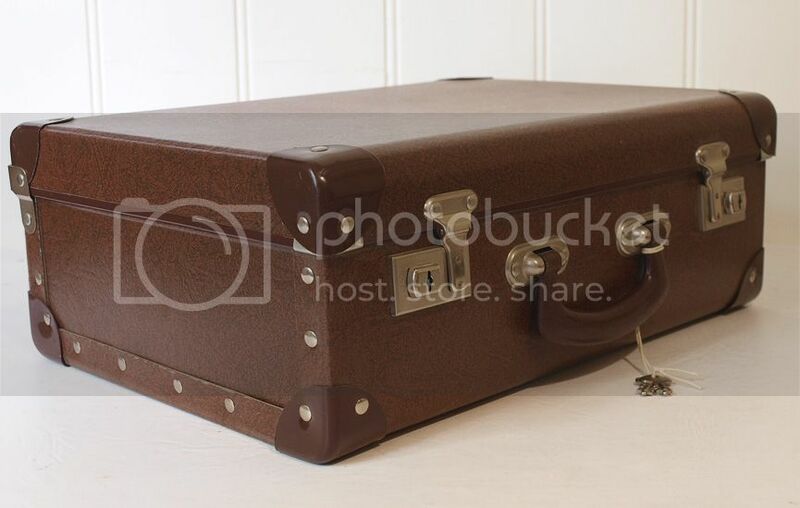 These 3 suitcases were in the Sunday Supplement, and then, magically at Christmas, they were mine! From that point, the catalogue / magazine started to arrive, and I would pour over it, imagining wearing the clothes, jewellery, and all their accessories. I wanted to be a Cath Kidston girl. The next item I covetted was the Red and White striped 'Ladies bag', which again, one birthday or Christmas, magically was mine. I was too scared to use it though, the pale colours begging to be marked or have something spilled on it!! When I was in my long term teaching post, I was desperate for a decent bag, that would age well - and so the brown leather weekend bag was my next Cath Kidston treat. The leather is now well worn, scuffed and looks all the better for it. The flower patterned insides means that you can easily find things, such as coursework, pens etc! And gives it a different edge. It does seem though, that since I've found the shop in Edinburgh, York, and the concession in Fenwicks, Newcastle, my collection has truly grown! My last mail order was about a year ago, and saw the addition of the striped blanket (yes, that multicoloured blanket the items are lain on, is also CK), the blue spot small saddle bag, and a mug or two. And it is more likely to continue! I've not included in the photo the items of jewellery I have - but I knew they wouldn't show up well in the 'bigger picture'. Now, the challenge is to compile your own collection. I've already got a list of other things I've 'collected' - but as my blog is mainly fashion orientated, I thought I would gently ease you in to my CK obsession... the others, well, they might take a little explaining!! Ladies, post away! Link back to me (please?) and your fellow collectors, and encourage others (not exclusive to the +Fashion blogging world) to join in! Love the satchels! In fact love everything! Such a fabulous collection...I really am fond of a bit of Cath Kidston floral, but am yet to own any...mainly because I'd become addicted! But am hoping tomorrow I'll be running on full brain power so I can follow suit and post my own collection....it was quite hard chosing as I've two collections!